Kenya – Len Bilén's blog, a blog about faith, politics and the environment. U.S taxpayers paid for backing Kenya’s new constitution. A Limerick. 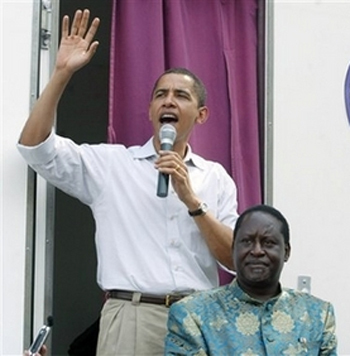 The picture at left shows Obama together with Raila Odinga during a campaign stop in 2006, while a U.S. senator. Last week, in response to inquiries from Reps. Chris Smith, R-N.J., Ileana Ros-Lehtinen, R-Fla., and Darrell Issa, R-Calif., the U.S. Agency for International Development, or USAID, admitted to spending more than $23 million of U.S. taxpayer money to influence voters in Kenya to pass the highly contentious constitution. Obama has paid for a new constitution. Not ours, but Kenya’s, sort of restitution. Isn’t it treason, or just my confusion? Posted on January 26, 2012 Categories faith, limerick, Muslim, Obama, PoliticsTags Constitution, Kenya, Limericks, Obama, politicsLeave a comment on U.S taxpayers paid for backing Kenya’s new constitution. A Limerick. Obama and Odinga in Kenya, A Limerick. The picture at left shows Sen. Barack Obama with Raila Odinga in 2006. 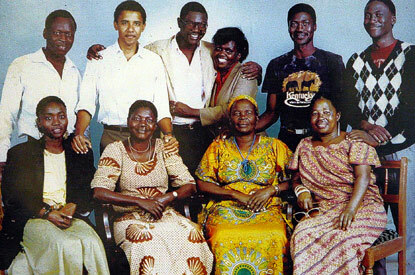 The picture at right shows Obama’s family in 1988 in Kogelo. In 2006, and his kin in Kogelo. Posted on January 26, 2012 January 26, 2012 Categories limerick, ObamaTags Kenya, Limericks, Obama, Odinga, politicsLeave a comment on Obama and Odinga in Kenya, A Limerick.